In Space Invaders Invaders, my intention was to put a novel spin on a tried-and-true formula. 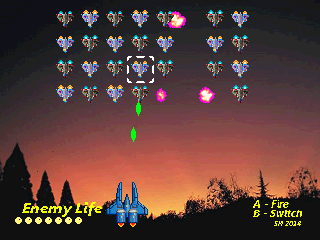 Instead of controlling the ship at the bottom, the player must use the invaders themselves to shoot down the "attacker". It's not meant to be earth-shattering; just a little game I had fun making. My starting point was a code sample written in French, which moved and animated a sprite. The first thing I did was to reduce the source code from around 100k to 9k, by removing unnecessary code, and refactoring, but leaving functionality untouched. Next, I translated everything, like comments and variable/function names, from French to English which was the first time I could use my foreign language skills together in a coding context. 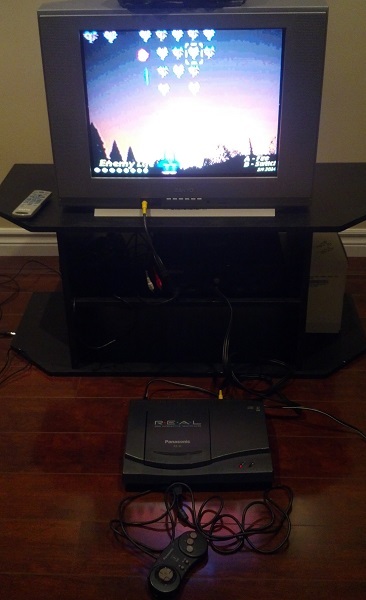 Dev kit and source code - The Space Invaders Invaders ready to compile source code within a dev kit; grab this if you'd like to compile and modify the game yourself, or develop your own games based on it. Tested in Windows XP. - Get a Windows XP machine (could perhaps be a VMWare virtual machine running a Windows XP VM). Perhaps other versions of Windows will work too, but I have had success with XP. - Run the build script compileAndBuildCDImage.bat and read the instructions in the console window as the script is executing. There are 3 stages to the build script: compilation, ISO image creation, ISO image patching.